Here is a better lit image of the piece i'm making for the tree exhibition. The front will be properly polished, the stag silhouette will be sandblasted and painted with the antlers more branchified (probably black) and the golden tree will be redone with finer detail. I was really making a mock up for a photo and substituting this piece of glass. Seeing it works so well I decided to use this piece of glass rather than the other I had been making specifically. My work draws on narratives from folk, myth and fairy tales to explore themes of individual transformation and metamorphosis. I am especially interested in how contemporary re imaginings from literature and film effect the continuity, meaning and relevance of an individual story. In every culture the tree has a symbolic role to play. In the realm of folk and fairytale, when the motif of forest or woods appears we can be sure that our hero (or our projected self) will be tested or challenged in some way. The liminal space of grove and glade are sites of personal introspection and growth. The history of the majestic deer / tree spirit is unknown. 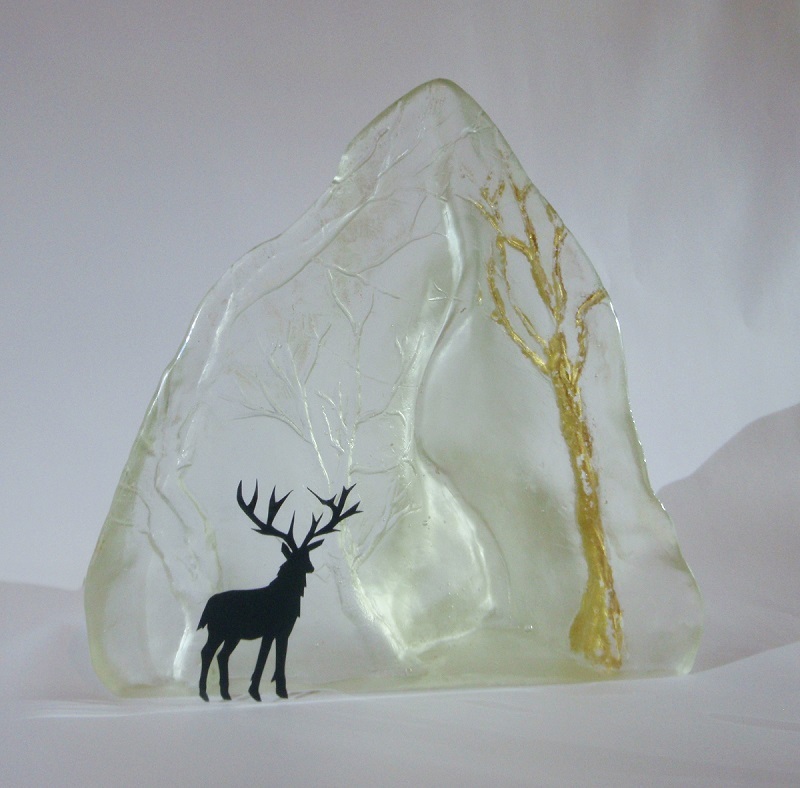 It is a modern hybrid, integrating the metaphorical qualities and symbolism of both the deer and the tree. Versions of this quasi mythical creature - who grows tree branches, sometimes in bud or bloom in the place of antlers, appear frequently in pop culture: from film to fantasy fiction, from t-shirts to tattoos. The popular image of the 'tree-antlered deer' is an example of 'myth blending', the seamless merging of symbol and folklore with modern storytelling genres to give birth to new tales that evoke the timeless pull of antiquity.